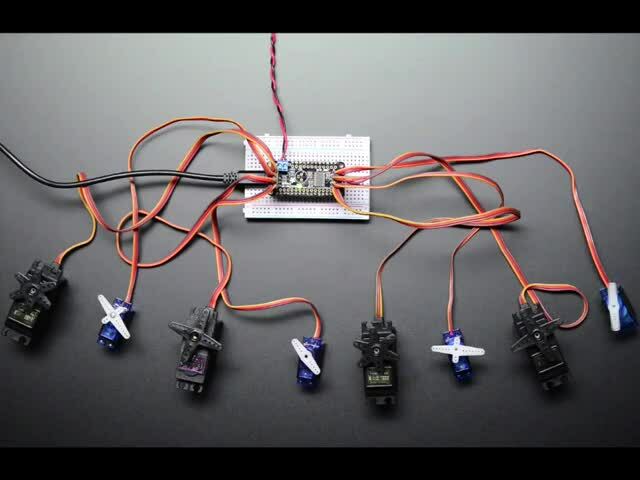 It's easy to control PWM or servos with the Adafruit 8-Channel PWM or Servo FeatherWing. There are multiple CircuitPython libraries available to work with the different features of this board including Adafruit CircuitPython PCA9685, and Adafruit CircuitPython ServoKit. These libraries make it easy to write Python code to control PWM and servo motors. First assemble the FeatherWing exactly as shown in the previous pages. There's no wiring needed to connect the FeatherWing to the Feather. The example below shows the FeatherWing attached to a Feather using the stacking assembly method, and wiring a barrel jack to the power terminal to attach an appropriate external power source to the FeatherWing. The FeatherWing will not power servos without an external power source! To dim an LED, wire it to the board as follows. Note: you don't need to use a resistor to limit current through the LED as the FeatherWing will limit the current to around 10mA. Connect LED cathode / shorter leg to FeatherWing channel GND / ground. Connect LED anode / longer leg to FeatherWing channel PWM. External power is not necessary to PWM an LED. To control a servo, wire it to the board as follows. 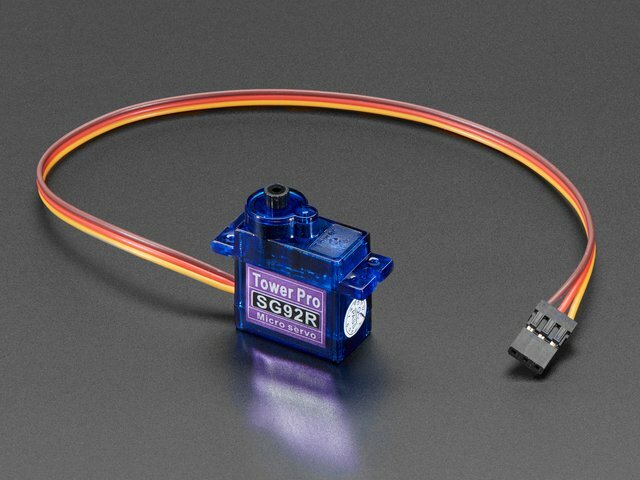 Check your servo datasheet to be certain. You must have an external power source to run servos! You'll need to install a few libraries on your Feather board. Before continuing make sure your board's lib folder or root filesystem has the adafruit_pca9685.mpy, adafruit_register, adafruit_motor, adafruit_bus_device and adafruit_servokit files and folders copied over. To demonstrate the usage, we'll use Python code to control PWM to dim an LED and to control servo motors from the board's Python REPL. This FeatherWing uses the PCA9685. 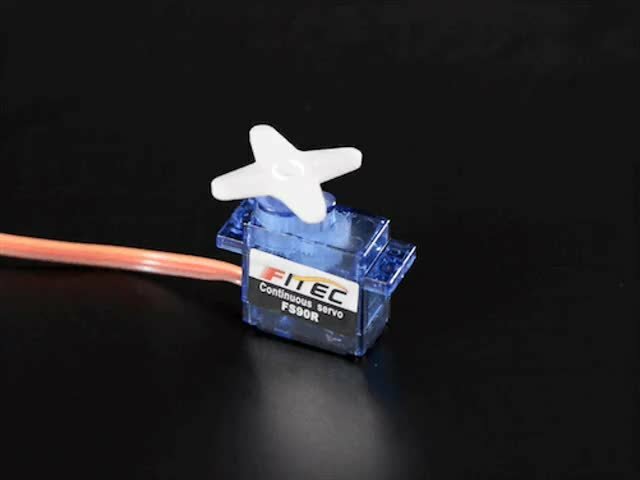 Each channel of the FeatherWing can be used to control the brightness of an LED. 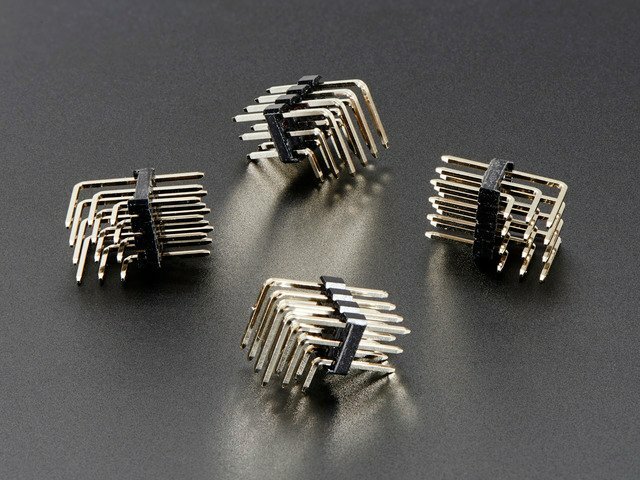 The PCA9685 generates a high-speed PWM signal which turns the LED on and off very quickly. If the LED is turned on longer than turned off it will appear brighter to your eyes. First you'll need to import the necessary modules, initialize the I2C bus for your board, and create an instance of the class. The PCA9685 class provides control of the PWM frequency and each channel's duty cycle. Check out the PCA9685 class documentation for more details. The FeatherWing supports 8 separate channels that share a frequency but can have independent duty cycles. That way you could dim 8 LEDs separately! The PCA9685 object has a channels attribute which has an object for each channel that can control the duty cycle. To get the individual channel use the  to index into channels. Now control the LED brightness by controlling the duty cycle of the channel connected to the LED. The duty cycle value should be a 16-bit value, i.e. 0 to 0xffff (65535), which represents what percent of the time the signal is on vs. off. A value of 0xffff is 100% brightness, 0 is 0% brightness, and in-between values go from 0% to 100% brightness. After running the command above you should see the LED light up at full brightness! You should see the LED dimly lit. Try experimenting with other duty cycle values to see how the LED changes brightness! These for loops take a while because 16-bits is a lot of numbers. CTRL-C to stop the loop from running and return to the REPL. That's all there is to dimming LEDs using CircuitPython and the PWM/Servo FeatherWing! We've written a handy CircuitPython library for the various PWM/Servo kits called Adafruit CircuitPython ServoKit that handles all the complicated setup for you. All you need to do is import the appropriate class from the library, and then all the features of that class are available for use. We're going to show you how to import the ServoKit class and use it to control servo motors with the Adafruit PWM/Servo FeatherWing. First you'll need to import and initialize the ServoKit class. You must specify the number of channels available on your board. The FeatherWing has 8 channels, so when you create the class object, you will specify 8. 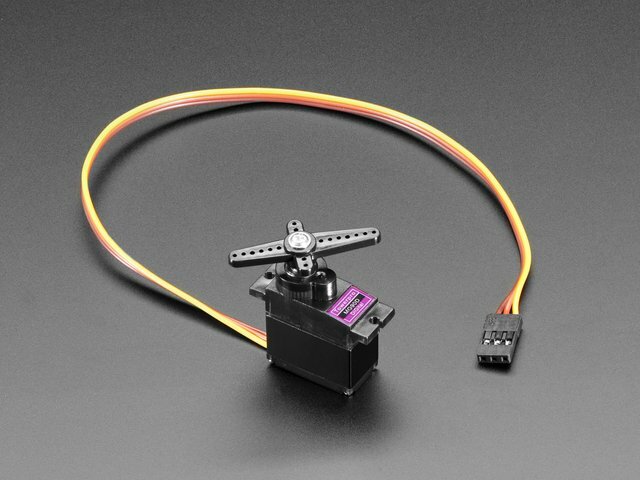 Now you're ready to control both standard and continuous rotation servos. To control a standard servo, you need to specify the channel the servo is connected to. You can then control movement by setting angle to the number of degrees. 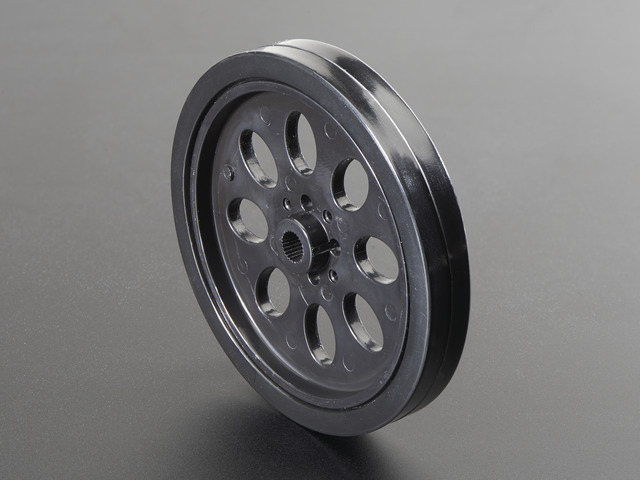 With a standard servo, you specify the position as an angle. The angle will always be between 0 and the actuation range. 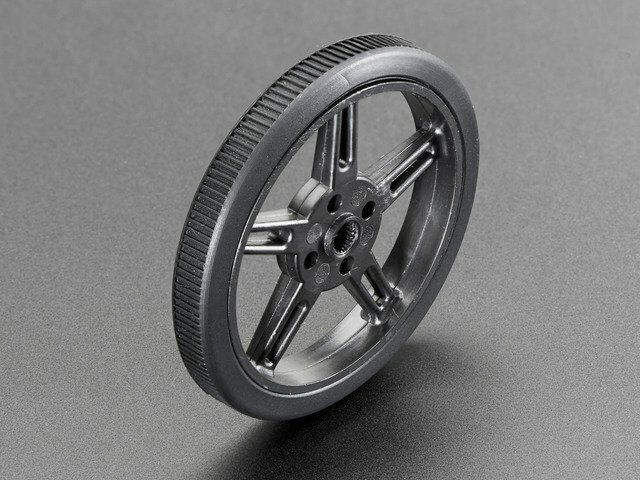 The default is 180 degrees but your servo may have a smaller sweep. You can change the total angle by setting actuation_range. Often the range an individual servo recognises varies a bit from other servos. If the servo didn't sweep the full expected range, then try adjusting the minimum and maximum pulse widths using set_pulse_width_range(min_pulse, max_pulse). That's all there is to controlling standard servos with the PWM/Servo FeatherWing, CircuitPython and ServoKit! To control a continuous rotation servo, you must specify the channel the servo is on. Then you can control movement using throttle. That's all there is to controlling continuous rotation servos with the PWM/Servo FeatherWing, CircuitPython and ServoKit! """Simple test for a standard servo on channel 0 and a continuous rotation servo on channel 1.""" # Set channels to the number of servo channels on your kit. # 8 for FeatherWing, 16 for Shield/HAT/Bonnet. This guide was first published on Jun 26, 2016. It was last updated on Jun 26, 2016. This page (CircuitPython Usage) was last updated on Apr 21, 2019.